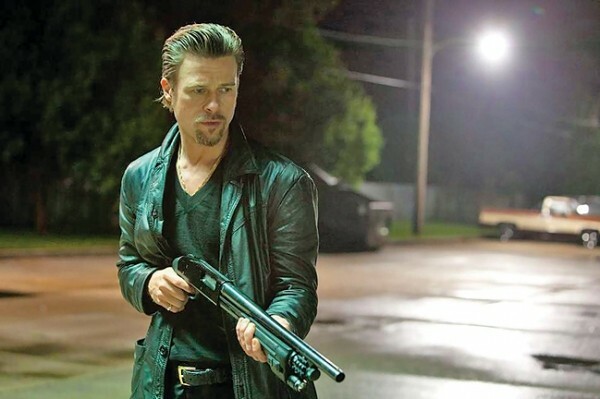 Writer/director Andrew Dominik’s heist thriller Killing Them Softly is set in 2008, during the height of the panic over the U.S. financial collapse and the run-up to Barack Obama’s election. I mention this because you might miss that crucial subtext if you’re not paying attention pretty much every time anyone in this movie is listening to a radio or watching a television. Because Andrew, buddy: We get it. We understand you’re turning the story into a metaphor for Great Recession malfeasance. It’s clear from the crime committed by Markie (Ray Liotta)—who arranged to steal from the card game he runs—that inspires a copycat theft. It’s clear from the interaction between hired killer Jackie (Brad Pitt) and the businesslike representative (Richard Jenkins) of the corporatized crime bosses who want Jackie to find the thieves. And oh, man, is it clear from the incessant intrusion of comments from George W. Bush, Barack Obama, Treasury Secretary Henry Paulson, etc. The shame of it is that Dominik has the makings of a uniquely down-and-dirty spin on familiar underworld material. Yes, the conversations suggest the latest in a 20-year lineage of post-Tarantino chatty thugs, but the actual card-room robbery is a clinic in minimalist tension. It’s even clear that Dominik had a fundamentally solid thematic idea: the role of distance in being able to live with doing something terrible. The film’s title becomes an almost absurdist suggestion that there’s a right way to destroy someone’s life—one that preserves the conscience of the destroyer. But that’s not good enough for Dominik, who churns out background-noise references to the meltdown any time there’s a moment of dead air, plus several ham-handed visual choices. There’s something richly cynical at the core of Dominik’s film, but he doesn’t trust the audience to put together the pieces that THIS MOVIE IS SET IN 2008 WHEN EVERYONE WAS GREEDY AND ALSO, ISN’T IT ALL VERY MUCH LIKE ORGANIZED CRIME.